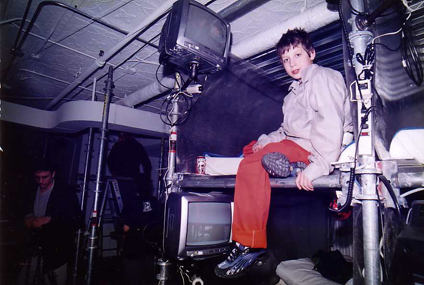 THEO CERIGO, the youngest member of the 100+ QUIET crew, in his pod, DEC 23, 1999. Theo is 11 at the time. He is wearing the standard issue QUIET uniform, orange pants and a grey work shirt. This helped identify the in-house crew from the huge throng of visitors, as QUIET was an open party 24/7. The shirts were soon, a day after this photo, silk screened with QUIET trademarks by MARK ENGER of EXPLODING SKY. JOSH HARRIS – of Pseudo and Jupiter.com fame, threw the 1 million dollar Millennium Party, held at 2 downtown loft buildings on Lower Broadway the week before and, a few days after JANUARY 1, 2000. It’s still the biggest, and edgiest, artist blow-out this town has ever seen. The whole place was wired with 24 hour camera surveillance, as you might deduct from careful inspection of the above photo. In effect, the first ‘reality’ show, JOSH hired a film crew led by ONDI TIMONER to film the event (24/7). Theo was the go-fer for the main film crew. Ondi is currently shaping a final cut of the party, called ‘THE BUBBLE’ which will place QUIET within the framework of the huge rise and bust of the most flamboyant and visionary dot.com millionaire to hit the fan, JOSH HARRIS. At his peak, the time of QUIET, he was worth 36 million, not bad for a guy from California who came to NYC with a used car that he sold and turned into Jupiter.com – the first internet ‘trend & tracking’ site. Some say Josh got too caught up by his immersion in the art world, and forgot to keep his eye on the bottomline. He had a definite eye for the edgiest talent in town, and now he’s just sitting back, waiting for his art collection to bring in his next wave of moolah..
An interesting aside .. JOSH HARRIS is the guy who financed the WORLD TRADE CENTER caper by GELATIN and paid for the helicopter & film crew that filmed it. GELATIN actually infiltrated the World Trade Center and built a little alcove balconey on which one could stand, out of a high WTC office window. talk about ‘gansta’ street art in forbidden places. The book about it, is sold out … but its out there. (I think JAMES WAGNER, an early GELATIN fan, has a copy). see some recent pix of ONDI TIMONER, and some of the QUIET crew. QUIET was eventually shut down by a c0mbined force of FEMA, the NYPD & the NYFD, (the NYC Police dept, the NYC Fire dept) for various reasons, not the least being FEMA’s belief that it was a ‘suicide’ cult ! .. not to mention the firing range, run by ALFREDO MARTINEZ, in the basement of the main building, … AND the toxic room, run by AIDAS BAREIKIS and AARON BREWER, right next to the pod hotel, designed and built by JEFF GOMPERTZ, that housed 100 artists ! JOSH HARRIS, who surfaced recently in Manhatttan before departing for SPAIN, is quick to point out now, that the next big call for FEMA and the NYPD and NYFD – was the World Trade Center disaster, …. think on that.